AeroCat LLC, an Indiana based high performance bicycle manufacturer, is pleased to announce the availability their new R350 road bike. The AeroCat R350 features an Aluminum alloy frame construction with traditional tube shapes giving it a classic look and feel. It is immediately available in three different standard complete bike configurations and can also be customized to meet specific performance versus budget requirements for customers. The R350 utilizes AeroCat's Fusion Alloy frame design and manufacturing process. "This bike really exceeded our expectations," said AeroCat President Dave Poole. "We were going after a classic look and feel with the right combination of geometry, tube shapes, and material selection. The bike handles very well and has a smoother feel than most traditional aluminum alloy frames. We extended the frame size offering down to a smaller 48 size to accommodate smaller riders and excelling juniors. The pearl white and deep blue paint gives it a fresh looking graphic design that fits in well with our brand family." AeroCat's R350 is available with three standard complete bike configurations that include either a Shimano 105 build, SRAM Rival build, or a Shimano Ultegra SL build. Standard configurations come with a high performance alloy handlebar, stem, and carbon seat post. The custom fork features a carbon fiber construction with an Aluminum Alloy steer tube. 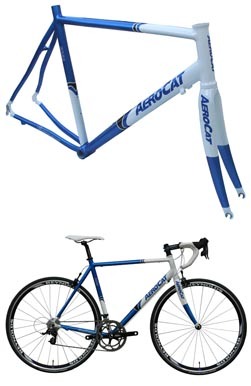 Frame geometry and more detailed information can be obtained by visiting http://aerocatbike.com/Products/R350.pdf. Aluminum Alloy 6066 butted tubing construction. 27.2 mm seat post receptacle. Available in 48cm, 50cm, 52cm, 54cm, 56cm, 58cm, and 60cm frame sizes. Complete bike MSRP starting at $1499. Complete bikes assembled in USA. Complete bike options available in various standard or custom configurations. See the company website. AeroCat products can be purchased at bicycle retailers in various locations in North America. The company is in the process of building its dealer network in the USA and welcomes new dealer inquiries. AeroCat, LLC is headquartered in Portland, Indiana, USA and is a manufacturer of high performance bicycle products. The company is committed to designing and building the finest performing bicycles for riders of all abilities and budgets. For more information visit the companys website at www.aerocatbike.com or contact Dave Poole at 260-703-8001 or email dave.poole@aerocatbike.com.